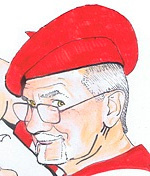 Steve is an artist/cartoonist/caricaturist/entertainer who plays to the peanut gallery while he draws. He adapts to the situation and crowd. He can entertain small children with G-rated material or push the envelope at adult parties.